Versatile brush for synthetic and natural. When set up for synthetic use the TERRA BRUSH is suitable for brushing in sand and rubber crumb. It levels off and breaks down uneven surfaces; disperses rubber crumb and improves ball performance. Importantly it helps return bristles to standing position so that pitches and carpets look well presented. When set up for natural use it brushes in sand and top dressings very effectively. It can also remove dew and tidies and presents turf as it moves effortlessly over the surface. The TERRA BRUSH works rapidly. Consists of four brush rows, two aligned perpendicular to the direction of travel and two in a zig zag arrangement. Such a formation allows an even distribution of sand, lengthwise and crosswise. Can be configured with 3 point linkage or as trailed versions. If the bristles become worn on one side after a long period of use, the attachable frame or tow bar can be reversed to ensure even and economical use. Optional spring tines are available for certain applications. 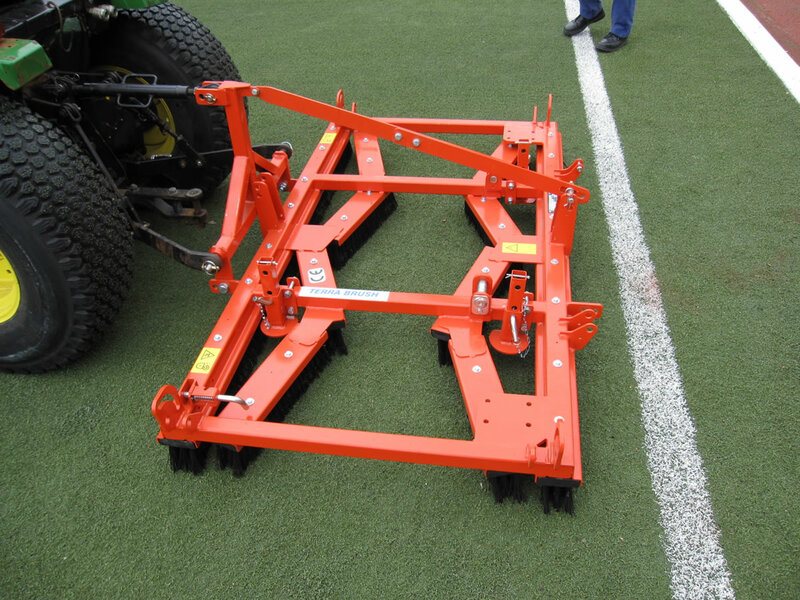 Optional equipment: Spring tine set, magnetic rail. If you are interested in our TERRA BRUSH use the quick enquiry form below.